Fine Art at Nepean Arts and Design Centre: Fine Arts Courses in 2013 Bus Launch! Fine Arts Courses in 2013 Bus Launch! A sneak preview of our bus ad: to see the whole thing, come to our bus launch on December 13! We are looking forward to a vibrant 2013 at NADC, and to celebrate and promote our 2013 Fine Art courses we are taking out an ad on the side of a bus, to showcase the great work of our students and staff, and let our community know about our wonderful student outcomes. More than seventy self portraits from the Me Myself and I project will adorn the side of a local bus that will travel the local region around Penrith and St Mary's. Me Myself and I is an annual project we host in the Trapezium Gallery at NADC, and features self-portrait images from NADC students and staff. The bus will be officially launched at on December 13, at the Bus Stop outside of Gate 1 in O' Connell St, Kingswood. All friends and supporters of Fine Arts at NADC are warmly invited to join us for this celebration. We will gather at 10am, for a 10.30 launch. Artists who are exhibited on the side of the bus get first dibbs on a seat, however if there are any spare seats, anyone can jump on board. If you don't get a seat, we would love to meet you at the Gallery if you can get there under your own steam. We expect to be back at the College around 12 noon, with one stop off point in Penrith on the way back. 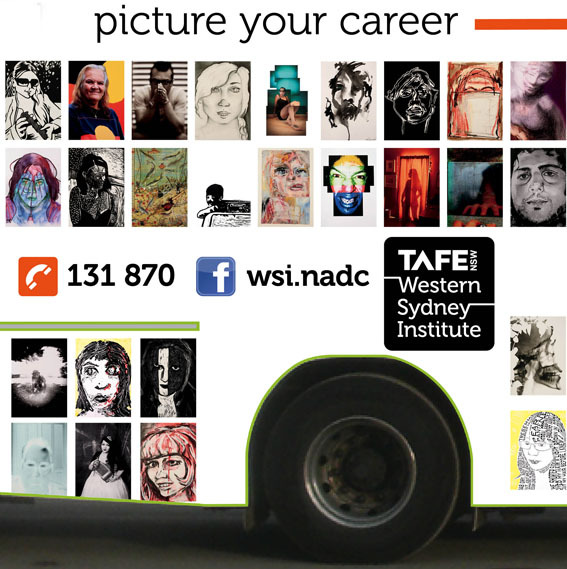 Artists whose names appear below have an image on the bus, and can book their seat by calling Regina Cooper on ph 9208 9484. Hurry though, we have more artists than seats, and places are filling fast! Aaron Berndt, Adele Bruens, Alex Curtis, AmorV, the late Arnold Freen, Blake Hicks, Carol Donovan, Chris Legaspi, Claire Lang, Constance Taylor, C Spillane, Danielle Pearse, David Raynor, Di Holdsworth, Elise Pike, Emma Smith, Eva Mahfoud, Georgina Taylor, Grace Edmonds, Jack Gibson, Jacqui Graves, Jade Martin, Jaimie Gall, Janet Reinhardt, Jason Dewhurst, Jeliza Vega, Jennifer Chapman-Paton, Jo Newton, Jodi McConaghy, Judy Frazer, Julia Samuel, Julieanne Bartolo, Julie Willis, Karen Normoyle, Karl Hellman, Karl Doyle, Katherine Kennedy, Kathryn Trippett, Katriona Asiata, Kerry Donnelley, Kimberley Miles, Lisa McKay, Lorraine Bateman, Lyndon Matts, Lynn Williams, Malcolm Nash, Maria Okon, Marion Brooking, Micheal Sharpe, Narwal Khatiwada, Naomi Murdolo, Natalie Horvat, Nelson Nyangole, Nerida Gibbs, Nicola Mason, Reena Mitra, Ricardo Della-Ricca, Robert Musgrave, Robyn Lewis, Rum Hort, Sally Evans, Samara Kendall, Sandra Hussey, Shannon Ring, Sharon Zou, Stephen Hall, Suzie Harris, Sue McDonald, Sue Evans, Susan Jorgensen, Tatiana Campos, Terrence Combos, the late Tim Dean, Tim Newman, Tom Brady, Tom Groves, Tracey Leigh Smith, Vaughan England. Congratulations to all represented artists, we would have loved to include many more, but we would need another bus! Two shows on the one night!